(Positive knots become negative knots if we switch either our nomenclature or the orientation on , so there are confusions lurking everywhere in this business. Also, note that although we needed on orientation on our knot to define the sign of a crossing, the sign is actually independent of this orientation, and only depends on the embdedding of the knot in ). 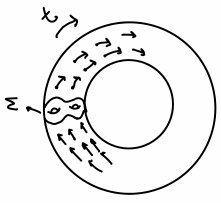 In other words, there is a punctured surface , and a map , fixing the puncture, so that the knot complement is the mapping torus for , as pictured below. Such fibered 3-manifolds are very special. Note that it is precisely because fixes the puncture that the line above closes up and becomes a knot. I should say, the proof that positive braids are fibered uses an even more amazing theorem of Stallings, which characterizes fibered knot complements in terms of a simple algebraic property of their fundamental group. This particular notion of positivity is one that appears in Matt’s paper. I recently read some work of Etienne Ghys talking about a related notion, and I thought it was so cool that I had to post about it. In this case, is called the suspension of . The question addressed by the theorem is: given a non-vanishing vector field on , when is it the suspension of a map ? Note that if we have such a suspension, and therefore a fibration over , we can pull back the form on to to get a closed, NON-VANISHING 1-form which is positive on . It’s not so hard to figure out that having such a form is equivalent to being a suspension. The really cool theorem is an apparently much weaker condition which is also sufficient. Theorem: is a suspension if and only if is contained in some halfspace. One remark about the measures : note that if we have a closed periodic orbit for , i.e. 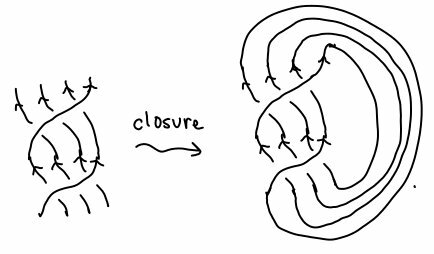 some closed loop which integrates the flow, then we get a natural set of measures which are concentrated near . In this sense, should be thought of as a set of generalized periodic orbits. The measures associated to actual periodic orbits just get sent by to the class represented by these orbits in . One way to think about the theorem, and this is how one of the proofs goes, is that just from this positive subset of homology, we can do some fancy functional analysis to create from this an actual dual form, not just a cohomology class, with the right non-vanishing and positivity properties. So somehow, we’re free to work just in homology without losing information, which seems very appealing. I’m not yet sure exactly what this theorem useful for, but it’s so neat. In a soon to come follow up, I will talk more about positivity on the knot side, and bleg about a concrete question that I’d love to get everyone’s opinion on. This takes me back. The first paper I wrote in grad school ( http://arxiv.org/abs/math/9803109 ) begins with a combinatorial version of this Freed-Schwartzman-Sullivan theorem you mention above (though I have never heard it called that). I notice that you didn’t mention that the proof of the FSS theorem is basically just Hahn-Banach. In case you are interested, Sullivan wrote “the definitive” paper on this topic, called “Cycles for the dynamical study of foliated manifolds and complex manifolds”, which goes deeply into the role of positivity in the theory of complex manifolds, taut foliations, calibrations, L^1-L^infty duality, max flow-min cut, etc.